CAMBRIDGE, Mass. – Black celebrities of the 19th Century were shown some of the same courtesies as their white counterparts. And it is their rare, distinctive portraits that are starting to get the attention of people on the U.S. mainland. 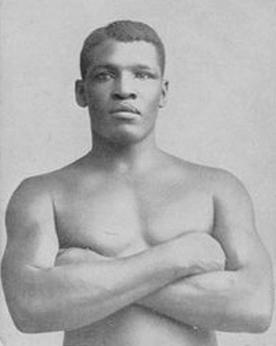 Especially St. Croix’s first Christiansted-born sports celebrity who later became known as “Peter The Great” and “The Black Prince” in international boxing circles – Peter Jackson. These striking and never-before-seen portraits of black citizens in Victorian-era England are going on display for the first time in the U.S., and organizers say the photographs have a powerful message for contemporary Americans riven by racism. “There’s a healing aspect to seeing these exquisite images,” said Vera Ingrid Grant, director of the Cooper Gallery of African & African-American Art at Harvard University. The show, “Black Chronicles II,” opens there Wednesday and runs through Dec. 11. “It changes our perceptions of the past, and can reverberate and change how we view the present,” she said. Researchers found the trove of glass plates wrapped in brown paper and tied with string in storage at London’s Hulton Archive. 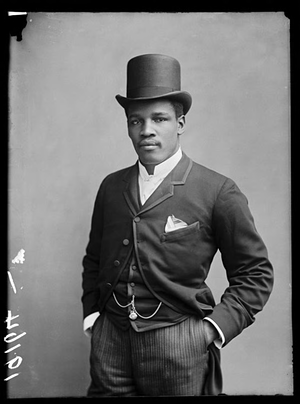 Originally snapped well over a century ago and an ocean away, they debunk any notion that Britons of African heritage were all but invisible in 19th-century society. Life-size black-and-white prints are interspersed with small snapshots, some culled from privately owned collections. They show ordinary people and a few minor celebrities posing for portraits in their Sunday best. Sequential shots capture a few playfully mugging for the box cameras that made the images, just as today’s wedding guests might goof around in a festive photo booth. Together, they help write what Grant calls “a missing chapter” — that blacks of the era not only were very present in daily public life, but also prospered and enjoyed a certain dignity and social status. Many of the more than 100 photographs on display were taken for “cartes de visite,” or calling cards: small, wildly popular postcards with an emblematic image and a splash of text. Much like a modern Facebook profile, they were designed to sum up the essence of a person. “How many of these stories were hidden in the attic and never saw the light of day? Look what was covered up,” said Grant. The show, curated by London-based arts agency Autograph ABP, depicts both ordinary and prominent citizens: artists, dignitaries, military personnel, missionaries, students, businessmen and international royalty. Among the better-known subjects are Sarah Forbes Bonetta, born in Sierra Leone and a goddaughter to Queen Victoria; Prince Alemayehu of Ethiopia, who was taken to Britain as a young boy after his father killed himself following defeat by the British; and heavyweight boxing champion Peter Jackson of St. Croix in the U.S. Virgin Islands, which belonged to Denmark at the time. “At the heart of the exhibition is the desire to resurrect black figures from oblivion and reintroduce them into contemporary consciousness,” said Renee Mussai, curator and head of archives at Autograph ABP. Grant believes the British photographs have more to say to Americans battling a resurgence of racism, racial profiling and white-on-black police brutality. She also hopes the show will inspire researchers to dig deeper into the role of blacks in U.S. photographic history.